What is Sea of Green? Sea of Green, or SOG, is a method of growing cannabis that forces the plants into the flowering stage when young and small. By starting the flowering phase of your marijuana plants after about two weeks of vegetative growth you can harvest many weeks earlier than you would if you grew your plants to full size. Why Choose Sea of Green? The Sea of Green method is a Dutch concept and is all about using space efficiently and is particularly useful if you are limited with the space available in your grow room (although it is also often used in large operations and greenhouse grows as well). By switching the cannabis plants’ lighting to 12/12 early (to force flowering) it is possible to fit several plants in the space normally taken up by one plant. Even though the yield of each individual plant is smaller, the accumulated yield per square metre will be greater. Time is also an important factor to consider when deciding whether to use the Sea of Green method. Some marijuana strains can spend well over 10 weeks vegetating so by putting your marijuana plants into flower after only two weeks you will get more harvests per year. This is ideal for larger operations where a constant supply is necessary. When growing BIG marijuana under artificial grow lights it is important to use the light in the most efficient way possible. Not just because you’re paying for its electricity; but because you will want to get the most from your plants too. Most grow room setups involve lighting your plants from above but doing this means that the plants shade out their own bases and the lower sections of the plant do not receive as much light as the tops. By packing the plants together a canopy of buds is formed, making best use of the light. If you are using one big HPS grow lights then you only have the option of lighting from above, using a number of HPS grow lights or better still energy saving full spectrum LED grow lights then you still have the option of lighting from the corners. The Sea Of Green method is particularly useful if you have a quantity of cuttings available from cloned marijuana. This method saves you money on buying seeds and can ensure the quality and gender of the young plants. Although Sea Of Green doesn’t generally require any pruning, once a canopy has formed some growers like to clean up the branches underneath to concentrate the plants’ energy towards the main bud and improve air flow beneath the canopy. These cuttings can be cloned and will provide the next batch of SOG plants, making a self perpetuating system. There are no special skills required to use the Sea of Green method. Once you understand the concept, carrying out an SOG grow is simplicity itself. 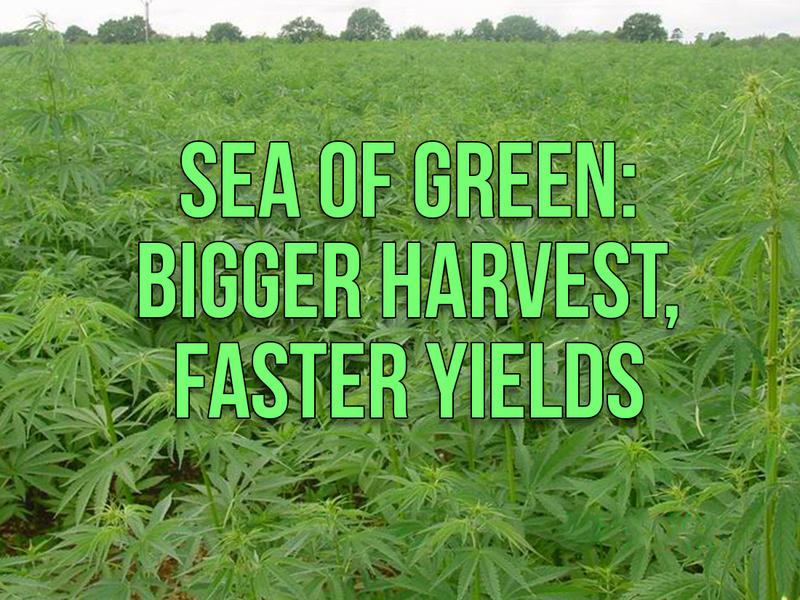 In fact, with the absence of any training or pruning requirements, SOG is one of the easiest ways to grow weed. Harvest your marijuana when ready. Some growers will start plants on 12/12 when they are only 6 inches high, others pack them more or less densely. Exact requirements will vary from strain to strain and grow room to grow room. If you use this guide as a starting point you will be able to make adjustments based on your own experience. Which seed strain – Are all marijuana strains suitable for S.O.G? The short answer is no. Typically indica seed varieties, with their naturally squat stature and single main kolas are most suited to S.O.G methods. Some sativas may work but they are generally too ‘leggy’ to fully benefit from SOG systems. We would recommend Old World Indicas, Kush strains, God Bud and Northern Lights. Also try some of the more specialized feminized dwarf strains such as Buddha Red Dwarf Autoflowering Feminized and Royal Queen Royal Dwarf Autoflowering Feminized.